It all started about a month and a half ago. 7 young, hopeful debaters started a journey of continuing DJ's debating legacy with high hopes of bringing back the Wira cup. 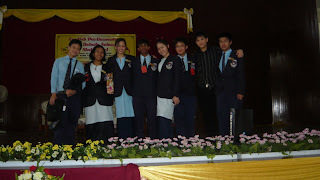 On 29th of April, 10 of us (me, Jay, Keefe, Daryl, Sophia, Rachel, Calvin, Kevin, Puan Koh and Puan Tan) went to Kuala Selangor for the battle of our lives for Wira debates at the state level, representing Petaling Utama along with 9 other districts in the whole of Selangor. The night of the semi finals and finals, the whole team was busy preparing and tightening up the caselines for the next debate. It was 11 pm and most of us were already sleepy and tired but we still had to discuss our 3rd motion so we decided to go for a walk around the apartment and at the pool. We sang and laughed and probably woke up the whole neighbourhood. Lol yea. Anyway, the next day was one hell of a day. The day started with an hour of quarantine for the motion 'The Future of the World is in The Hands of the Technologists, Not Naturalists' and we were the opposition and went against a school from Hulu Selangor. The opposing team was good and DJ's debaters for the round (Sophia, Daryl and Keefe) had a tough battle to fight. While waiting for the results, I went out of the room and cried. I cried because I was worried about the team, I was worried that we wouldn't pass through that round. That was the first time ever I cried because of debates......and I wasn't even debating! But we all did our very best and WE WON. Daryl even got the Best Speaker for the tough round. He was so passionate and confident when delivering his speech and I would say that was his best performance. Great job, Daryl! And with that, we were in the finals. Half a step to becoming the state champion and a step closer to the Wira cup. The motion was 'The Growing Sense of Individualism is the Root Cause of Disintegration of Today's Marriages' and we were the opposition, again and went against Petaling Perdana. Sophia, Daryl and Keefe spoke again. In terms of manner, we won hands down. DJ had the better, more eloquent speakers. We went with a sneakier approach and our opponents couldn't catch that and even the judges were a bit blur and because of that they decided to award the win to our opponent, leaving us as the 1st runner up and destroying our hopes of becoming Selangor state champion. So near yet so far. We were just half a step away from being the state champion. The whole team worked extremely hard to reach this far. This was the furthest any DJ's debate team ever reached in the last 4 years. We dropped everything to give our best for this debate. Classes being missed, homework being put on hold and exams being forgotten for a moment. But each and everyone of us who were part of the debate team knew we did our best and at the end of the day it all went down to God, luck and fate. And we didn't go back to PJ empty handed. We went back with dumb looking trophies and certificates. But the most important thing is that we went back with a long-lasting friendship that was forged during our discussions in the library or Bilik Tayangan or the debaters' houses; the invaluable debating experiences and with that we grew up as more mature debaters. This was one of the most exhausting, painful, interesting journeys I had ever been through. But again the experience and the lessons I got from this journey would be something I'd treasure and remember for the years to come. 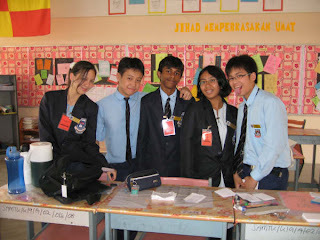 20 years down the road, I won't remember my Form 4 mid term exam marks but I would remember that I was part of a great debate team that stayed together through thick and thin and we were just a half step closer to being the state champion in 2008. Yes, we went through hell before we reached the finals. In the process of preparing for the debates, we were all stressed up.Some of us felt like cutting our wrists. Some of us felt like slithering each other's throats. All of us had our fair amount of emotional outbursts but what doesn't kill you will only make you stronger. We were still a team and we will continue to be a team. This ain't the end of our journey as debaters. This is just the beginning of our journey. There are more debate championships in the future, be it in DJ or elsewhere. Once a debater, always a debater. Finally, a big heartfelt THANK YOU to our tireless coaches: Kevin, Puan Koh, John, Puan Mag, Marc and those who were with us through thick and thin. May God bless! ;) I feel so proud and nostalgic reading about all this.